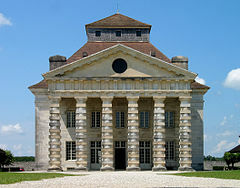 The Royal Saltworks of Arc-et-Senans, near Besançon, was built by Claude Nicolas Ledoux. Its construction, begun in 1775 during the reign of Louis XVI, was the first major achievement of industrial architecture, reflecting the ideal of progress of the Enlightenment. The vast, semicircular complex was designed to permit a rational and hierarchical organization of work and was to have been followed by the building of an ideal city, a project that was never realized. The Great Saltworks of Salins-les-Bains was active for at least 1200 years until stopping activity in 1962. From 1780 to 1895, its salt water travelled through 21 km of wood pipes to the Royal Saltworks of Arc-et-Senans. It was built near the immense Chaux Forest to ensure its supply of wood for fuel. The Saltworks of Salins shelters an underground gallery from the 13th century including a hydraulic pump from the 19th century that still functions. The boiler house demonstrates the difficulty of the saltworkers’ labour to collect the “White Gold”. This article uses material from UNESCO World Heritage List article "Royal Saltworks of Arc-et-Senans", which is released under the Creative Commons Attribution-Share-Alike 3.0 IGO License.